You are looking at the silver medal for the storming of Warsaw. The Medal was established on December 31, 1831 during the reign of Emperor Nicholas I to commemorate the storming of Warsaw by the Russian army between August 25 and 26, 1831. 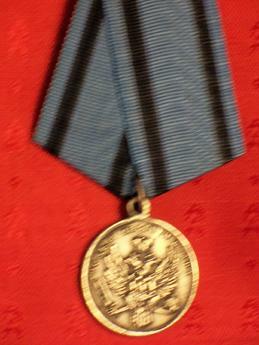 The silver medal was awarded to all non-commissioned officers and enlisted men who distinguished themselves in the storming of Warsaw and to medical personnel and chaplains who carried out their duties on the field of battle. The obverse of the silver medal shows the Russian double-headed eagle with a small coat-of-arms of Poland placed upon its breast. 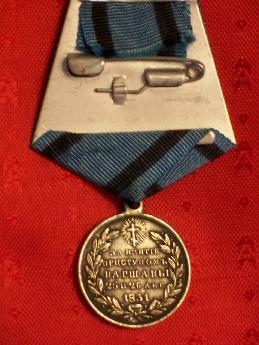 In the centre of field the reverse of the Medal has an inscription meaning: "For the Storming of Warsaw 25 and 26 August 1831", surrounded by a laurel wreath, topped by a Russian Cross emanating flaming rays.